Nurse leaders are responsible for designing, implementing, and evaluating client care, advocating for business practices that promote healthcare quality and patient safety, and synthesizing knowledge of key business and human resources practices to effectively lead healthcare teams. While nurse leaders may serve in a number of environments, the highest populations can be found in general medical and surgical hospitals, offices of physicians, outpatient care centers, home health care services, specialty hospitals, psychiatric and substance abuse hospitals, and medical and diagnostic laboratories. For their experience and service, nurse leaders often earn higher salaries than other types of nurses. This is especially true in highly specialized fields and large markets in places such as DC and New York. For example, the average salary for nurse leaders (managers) was $96,450 in 2016. However, those working in the Washington-Arlington-Alexandria, DC-VA-MD-WV metro area averaged $132,070. In Nassau County-Suffolk County, New York, the average was $147,640. Nurse leaders in pharmaceutical and medicine manufacturing averaged an impressive $216,910 and those in navigational, measuring, electromedical, and control instruments manufacturing averaged $162,580. Nationwide, high performing nurse leaders earned more than $172,240. To become a nurse leader, it will take superior skills, years of experience, and an advanced degree. Most positions require a master of science in nursing (MSN) or higher, with a nursing leadership or nurse leader track. Sample courses for the track include healthcare finance, the business of healthcare, and operational quality in healthcare, strategic human resource management practices, leading nursing into the future, and of course, leadership. 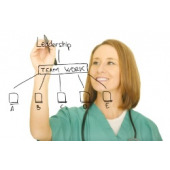 Many MSN in nursing leadership programs may be completed in as few as two years, full-time. Some online programs may be completed even sooner. Some of the best online options include American Public University System (MSN: Nurse Leader), Rasmussen College (MSN: Nursing Leadership and Administration), and West Coast University (MSN: Nurse Leader). For more options, we’ve compiled below a list of the best online schools for an MSN in nursing leadership. Begin your search today!